To order a printed copy of the Visit Eden 2019 brochure, simply click the Request button below. This beautiful corner of Cumbria holds the key to many unforgettable memories. Nestled amongst an Area of Outstanding Natural Beauty, stunning valleys and charming country towns, Eden is the perfect escape. Whether to indulge in great local food, wander magnificent landscapes or enjoy peace and quiet, Eden is the ideal holiday destination. Whatever holiday you're looking for, Eden's unique setting and vibrant culture make it the ideal choice. Order the Visit Eden brochure now for a rejuvenating holiday you'll remember for a lifetime. 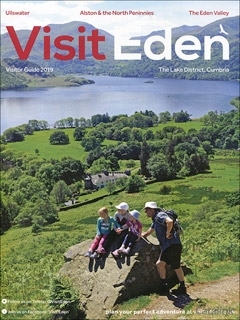 Visit Eden 2019 Brochure Anne W. said: We are planning a trip soon so the brochure will provide some very useful information on local attractions etc. RT @DalemainMansion: It's another gorgeous morning. Perfect weather for sitting out in our beautiful courtyard and enjoying the sunshine! Shore to Shore Cottages offer accommodation across the UK in a variety of picturesque locations. Whether youre looking for a country break with the kids, a romantic getaway, or you simply want a break from the hustle and bustle of city life, were sure we can find something for you. Visit Wyre invite you to explore the beautiful views, wonderful walks and mouth-watering local food of Lancashire. Request your digital brochure today for inspiration on your next UK getaway! By pressing the Request Printed Brochure button you give consent to Visit Eden 2019 (and their Data Processors for the specific purpose of delivering your literature) to send you their Brochure .